The Complete Idiot's Guide to ASMR. (2015 Alpha Books) Co-Author: Ilse Blansert. ASMR (Autonomous Sensory Meridian Response) starts with a tingling feeling in your head and results in feelings of deep calm and relaxation. What triggers ASMR isn't the same for everyone, but mostly it's caused by sounds and experiences you most likely encounter every day. It's an intriguing topic and one more and more people are being drawn to. 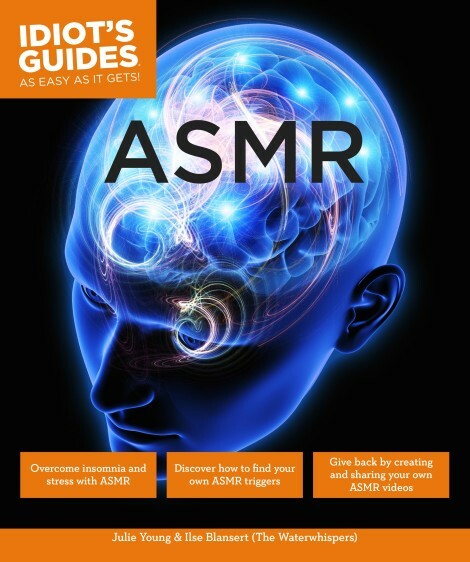 In this helpful guide you will get an easy-to-understand explanation of what ASMR is, how it works and its benefits; an exploration of various ASMR triggers, and guidance on using ASMR for safe and natural relief from insomnia along with tips and advice from ASMRtists from around the world! The Complete Idiot's Guide to Catholicism. (2015 Alpha Books) Co-author: Fr. Eric Augenstein. Billions of people all over the world identify as Catholics, but for those who aren't of this faith or have been away from it, its rites, rituals, prayers and saints can be confusing. This helpful guide, written from the pulpit as well as the pew offers a clear, easy-to-understand look at the history, culture, structure, values, traditions and beliefs of the Catholic Church. Fifteen Minutes of Fame (2014 Rocking Horse Publishing) It was the story that rocked the music world. After five years, four Grammy Award-winning albums, numerous Number One singles and outselling every other act in the music industry, entertainment icon MonAmi was a walking case of burnout. When her plans for rest and relaxation were derailed on the final night of what was supposed to be her Farewell Tour, the enigmatic singer took matters into her own hands running away from her career, her manager and the mysterious identity that made her into a superstar. Now a rocker gone rogue, MonAmi returns to her hometown of Kentwood, Indiana where as 15-year-old Megan Taylor she was plucked from obscurity and molded into rock and roll royalty with a new name, a lucrative recording contract and a carefully crafted Hannah Montana-like image. However, what started as a teenage dream, quickly turned into a living nightmare as her label gradually controlled every aspect of her life telling the singer: what songs to write, what to wear, when to tour and who to date. “The Suits” know that MonAmi has a short shelf life as a music sensation and they are determined to get everything out of her before her fifteen minutes of fame are over. The Famous Faces of WTTV-4 (2013 History Press.) Growing up in central Indiana in the 1960s, ’70s and ’80s would not have been complete without our favorite hosts from WTTV-Channel 4. Sammy Terry set the spooky scene for Friday-night fright flicks. Cowboy Bob rode in on horseback with daily delights at the Corral. Commander KC brought education to television. Along with Janie Hodge, Peggy Nicholson and regional characters, these local hosts were bona fide television stars before national programs began broadcasting kids’ shows around the clock. WTTV’s homegrown shows and endearing hosts endure in the hearts of their loyal fans. Join historian Julie Young on a journey behind the curtain of your favorite Channel 4 shows, as she offers a look at a pre-cable era when shows were live, hosts were local celebrities and anything could happen! CYO in Indianapolis & Central Indiana (2011 History Press.) Join historian Julie Young on this nostalgic look at the Catholic Youth Organization (CYO) of Central Indiana, from football jamborees at CYO Stadium to fun times at camps Rancho Framasa and Christina. Share in the recollections of senior members who matured and found their voices - and often their future spouses - through their CYO experiences. Pull the award-winning apple pie from the oven and give the kickball a good boot in this spirited celebration of the CYO, a thriving organization that's ministered the spiritual, social, cultural, and athletic needs of countless young people throughout Central Indiana. A Brief History of Shelby County (2010 History Press.) Shelby County, Indiana, was established by pioneers who carved a path enabling future generations to create cities, towns and other communities that remain a testament to the quiet strength and character of a people steeped in the core values that define America. These are the people who worked diligently, possessed vision and farmed the land that fed a nation. Join author Julie Young as she celebrates the history of these sturdy people and their community on the outskirts of the Capital City, where the American dream was created. Eastside Indianapolis: A Brief History (2009 History Press.) Eastsiders are a fiercely loyal bunch. No matter where you go in life, the connection to the Eastside remains. In its early days, Indianapolis was designed to be a city of only one square mile, but as settlers flocked to the Circle City, a steady beat of progress made its way across the Eastside. Through their dedication to maintaining the character of neighborhoods like Woodruff Place, Fountain Square and Irvington, Eastsiders have banded together time and again to preserve the memories of landmarks like the Rivoli Theatre and Al Green's. Julie Young, a lifelong resident of the Eastside, celebrates one of the most culturally diverse areas of Indianapolis as she illuminates the strength and determination that would make any resident proud to call the Eastside home. Images of America: Historic Irvington (2008 Arcadia.) Founded in 1870, historic Irvington serves as a time capsule to the bygone days of the Victorian and Edwardian eras. The once autonomous community along the Pennsylvania Railroad and U.S. Route 40 has a history as rich and spellbinding as the legendary tales of its namesake, Washington Irving. Featuring plenty of architectural diversity and notable citizens, Irvington served as the original home to Butler University and became known as a cultural, arts, and academic pillar of the Indianapolis landscape. Today Irvington continues to be the gem of Indianapolis's east side with locally owned shops and businesses along with a community that is committed to the past while focusing on the future. A Belief in Providence (2007 Indiana Historical Society Press.) Mother Theodore Guérin was a pioneer on the Indiana frontier and the founder of the Sisters of Providence at Saint Mary-of-the-Woods. A Belief in Providence: A Life of Saint Theodora Guérin, a youth biography, explores the life of the woman who would become Indiana's first saint. Born in France, Guérin joined the Sisters of Providence, came to the United States to found an establishment near Terre Haute, Indiana. Despite poor health, primitive frontier conditions, and dealings with a contentious archbishop, she founded Saint Mary-of the-Woods College and opened schools in Jasper, Madison, and Vincennes. The book also examines the process leading to Guérin's canonization on October 15, 2006. Rock and Roll Saved My Soul (2014) Editor: Kate Marie Robbins. "Changing the World, One Story at a Time"
Has music had a positive impact on you? Changed your life? Or even saved you? For us, it has. In this book, you will find a collection of stories, letters, and poetry about how music has personally changed our lives. Each story is unique, each story is true. Filled with emotion, passion, and love for the bands and songs that have touched our lives. All proceeds from this book will be donated to Rock the Cause. Rock the Cause is a Minnesota based charity that use the power of music, community, and social media to create a new generation of stewardship for other non-profit causes.